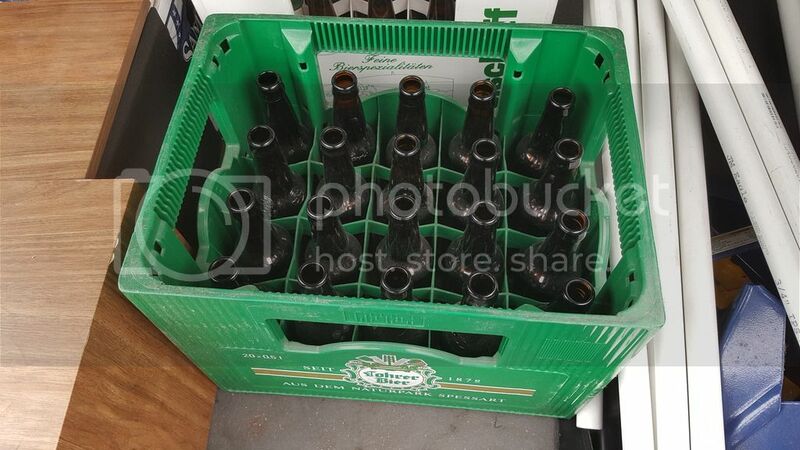 Two cases of bottles with the plastic crates for $6.00!! That's awesome. I bought some from a company called C&W Crate in 2013 but have since went out of business. I have 12 oz and 22 oz corrugated plastic carriers. Love them. Those plastic crates are cool. Do you have a source for them minus the bottles-- I have plenty of them? When I started brewing about 3 years ago, the only bottle storage I had were the cardboard shipping containers furnished when you bought new empty bottles --definitely not sturdy enough to handle the weight of filled bottles. Fortunately, one of the guys in the local brew club cleaned out his garage and gave me three of the sturdy 24-bottle cardboard cases that filled bottles used to come in. But if you have source for the plastic ones, I might pull the plastic card out of my wallet. A 20-bottle case? Are they ancient, or just weird? German branding on the side. 20 is Pretty standard there. Better eyes than me, Jeff! 20 .5L bottles that are not with the case anymore. The case is worth more to me than the bottles. I brought several cases back from Germany from an Army tour. Sorry. No source. Just a fluke chance at my LHBS. +1. They actually deliver beer in those crates to your door (Getränkeservice or Getränkedienst). They trade out the empties with a full crate like the milk man did when I was a kid.